OOR WULLIE BOOK 2 MAKES £1450! 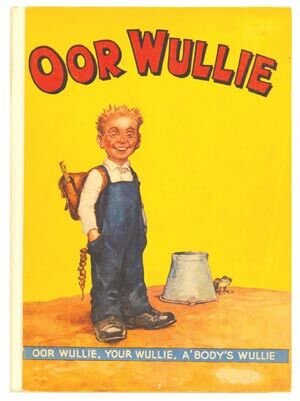 Hot on the heels of the record-breaking first Oor Wullie Book of September's auction, this happy, dungaree clad lad's second edition found a mid-estimate £1450 including 10% buyer's premium. His artwork also continues to find strong bidding. 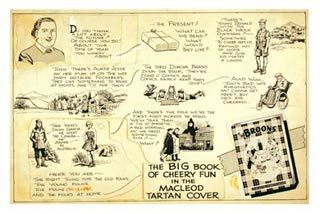 In an episode from January 1944 The Wee Lad reads a book on actin' and goes off to Wellgate Concert Hall to entertain the troops. Bunking on stage behind the manager's back, Wullie gets pulled off twice but in the end his "Harry Lauder" wins over the raucous audience and, 'He's no sae bad efter all'. £931 was also no sae bad for a few stage impressions! 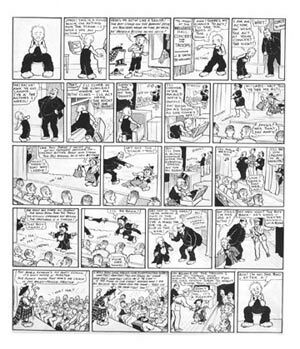 A further Oor Wullie segment artwork, only featuring the last two strips of a story, made a healthy £300 as Wullie ran from the polis but the bobs only wanted to give him a five-bob reward! Wherever that wee lad runs, The Broons are not far behind. Two pieces of artwork both featured Paw fergettin' the tickets. First the whole family's at the station with the lost tickets on the pavement right behind him as he rifles through his pockets. In the second they're awa' at the fitba'; the lads win one-nuthin; Paw throws his cap (and the train tickets) into the air. A fish lorry is their pungent ride home. Both boards were signed by Dudley Watkins and made £605 and £680 respectively. Just the ticket. Even Ma got in on the act with a rare ad encouraging all the Sunday Post readers to plan that special gift for family and friends; at hame and awa'; The Broons Book for 1960! £350 was the above estimate winning bid. 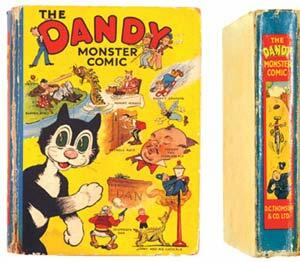 The prolific Dudley Watkins only illustrated the first episode of Young Drake in the Dandy No 644 from 1954, so this complete artwork in its six component strips was hotly contested to £786, over 20% above its upper estimate. D C Thomson artist, Paddy Brennan, drew all the other boyhood episodes of the lad who was later to become Sir Francis Drake. 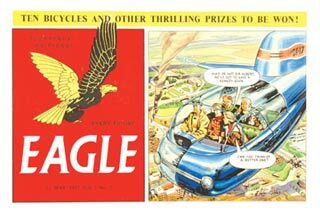 As artwork continues to feature strongly in our auctions and more collectors come into the field, let us briefly keep you abreast of winning bids from November: Desperate Dan by Dudley Watkins (Dandy 1949) £650; Dan Dare one panel artwork by Frank Hampson (1952) £495 (see above); Dan Dare cover by Harold Johns and Greta Tomlinson (1952) £600 (25% below estimate); Blackbow The Cheyenne by Frank Humphris (Eagle 1966) £193; Billy Bunter by Alfred Pease (Knockout 1959) £70; Buffalo Bill by Steve Chapman (Comet, early 50s) £109; Black Bob by Jack Prout (Dandy Annual 1957) £165; Outlaw Posse cover by Chas McConnell (Western Library 1952) £100; Two Captain Condor pages by Neville Wilson (Lion 1967) £165; Battle Picture Library cover "Blitzkrieg" by Caraselli (1962) £162; Brett Million by C F Eidlestein (Boy's World 1964) £165, and the brilliant Charley's War by Joe Colquhoun (Battle-Action 1980) £385. 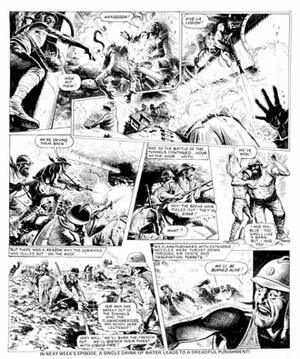 A further full selection, including the final Charley's War piece consigned to us, will be on offer in our February auction in 2006. Don't get the impression that stalwarts Dandy and Beano are ever sidelined, it's quite the reverse. A tatty Dandy No 4 with indented sew holes and tears, once part of a tightly bound volume, made £352 (it was the first Xmas issue) and subsequent lower grade issues from Nos 5 to 9 realised £125-135 each. The Xmas Beano 195 from 1942 was chased to £332 with its, "Jerry Won't Be Merry This Xmas If You Do Your Bit", propaganda tagline. Our loose-spined Dandy Monster Comic 1 made its lower estimate £1200 and the successful bidder was very pleased to take away Korky and his pals between these bright boards. Our collection of bound volumes stretching over several decades continues to find eager buyers. From the First World War period Penny Popular 1-64 made £223, School Friend 1-33 made £330 (there are a determined bunch of Girl's Comics collectors out there) and between wars Kinema Comic volumes reeled in £264 a piece. 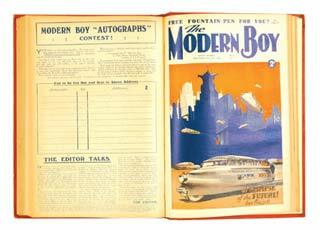 Two lots of Modern Boy did particularly well, their post-modern, deco covers always finding favour. Bound volume 1-21 (1928) made a very modern £495, with issues 22-47 finding a further £385. Knockout and Film Fun from the forties also performed strongly, their volumes selling in the £230-330 range each. TV Fun 1-15 from 1953 was not to be outdone with a handsome £248 topping the bill. Rupert is not as strong in the salerooms as he has been of late and his first annual from 1936, with rare complete dustcover made a below estimate £1400. 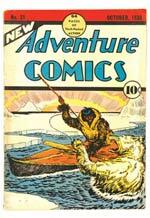 The colour-in pages were neatly coloured in and the cover did have some light tape on the inside to strengthen its edges so this may have been a determining factor. Topper comic in on an upward spiral; a first issue from 1953 in VG+ grade did Mickey The Monkey proud at £137; The Swanee Hummer with No 2 played an almost identical tune, and a high grade No 3 came in at £105. Topping results, but the long-suffering followers of this column would expect me to say that! Notable sixties titles to impress were Hurricane: 44 issues from No 1 in two bound volumes at £385; Boys' World first two volumes at £137 each, and nearly every loose issue of JAG between 1-48 in high grades at £220. Some of our US section highlights included a FN- graded New Adventure # 31 featuring Federal Men by Siegal & Shuster and Rusty by Bob Kane at £280, (Superman and Batman, anyone?). 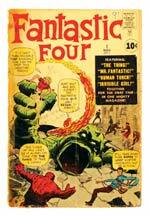 We sold a good run of low grade early Fantastic Four issues with the well marked, well worn # 1, illustrated above, finding a relatively firm £276. There was a Fantastic Four 47 cents copy in NM- which was taken to £95, a Daredevil 1 in VG+ for £141 and single lot of 96 X-Men from 1978-84, also at £276. 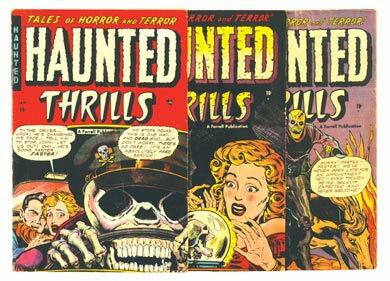 We just had to show you this fun-filled illustration of Haunted Thrills covers so we could wish everyone out there, every boy and ghoul, the happiest of holidays!